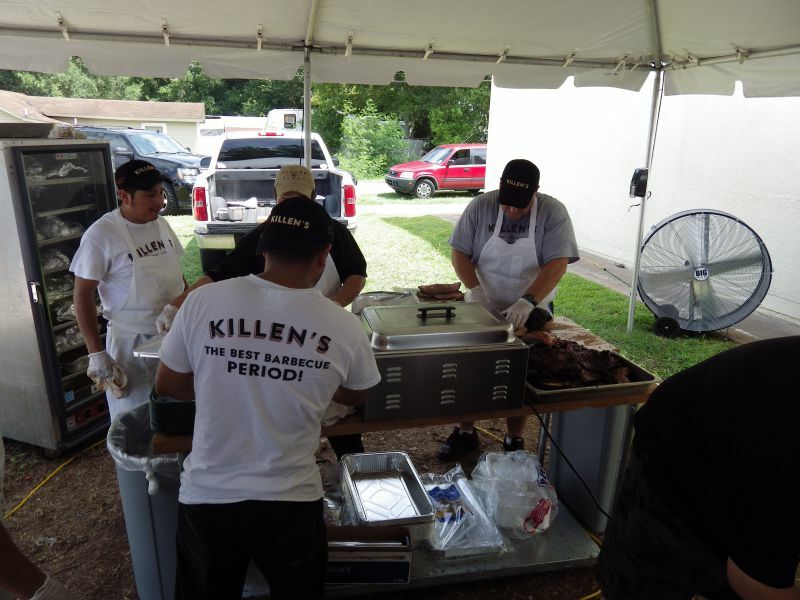 I had wanted to get back to Killen’s and also check out a couple of other BBQ joints in the Pearland area. The forecast looked like the rain wouldn’t be a total washout so we made our plans for July 27th. 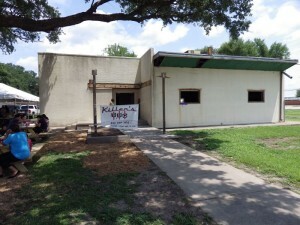 Killen’s temporary popup is only open on Saturday and Sunday while the permanent location is being built out. We took the motorcycle in order to get some points for the BBQ contest but I was pretty nervous about both the weather and our route. There wasn’t a decent route with good motorcycle roads without doubling or even tripling the distance so we sucked it up and used IH 45 as our primary road. I really dread taking the interstate and it was less than 10 minutes of riding on I.H. 45 before a car swerved into our lane, nearly taking us out. I hit my horn but they didn’t stop moving over. Luckily the next lane over was open so I pulled up alongside them and tried to get the attention but the somewhat older gentleman didn’t acknowledge me. I don’t let the rage build up but it still gets frustrating when people don’t even realize what they are doing. They probably thought I was some crazy biker and had no concept that they nearly killed us. We kept rolling down towards Pearland and rode through a very quick and very light sprinkle. Closer to our destination I could see standing water in parking lots and on the sides of the road; it looked like we had just missed a larger rain event. We didn’t miss the humidity though, and even breathing was more labored than normal. We rolled into the parking lot at 10:30am and while there was a line of about 35 people we were able to find enough room to park the bike in the parking lot rather than having to park along the street. The lot is partially used by the temporary pop up and even once the permanent location is open, the weekends will find people parking on the nearby streets. One thing to note when parking here; do not block any residential driveways nearby. During our last visit the police were called and on this visit we saw a tow truck pull up. It may be that people don’t realize how long they will be parked there, but its common courtesy to ensure a driveway is not blocked. 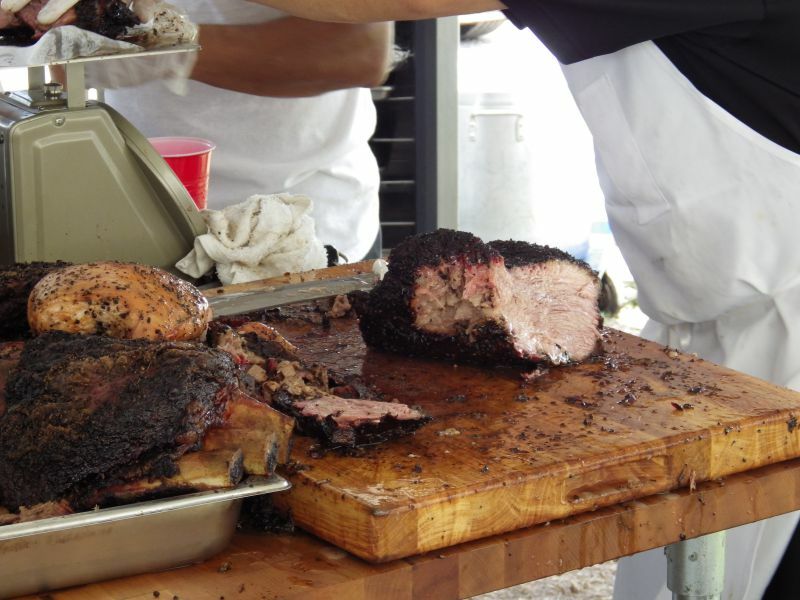 Don’t be the person whose BBQ lunch is ruined. At about 10:50 a young lady walked down the line handing out free Lone Star from a keg. I really like the joints that offer free beer and handing them out is a nice touch. There is a tip jar so don’t forget to bring a few bucks in cash even though they do take credit cards here for the food. The line grew to about 80 people by 11:00 when they opened and moved in typical BBQ trailer fashion, which is to say pretty slow but not really any worse than most. Ronnie Killen handed out a few samples of turkey to people in the line when we were nearly at the ordering station and it was really good. The turkey was extremely moist and tasty but it doesn’t absorb the smoke like beef and I usually shy away from ordering it myself. 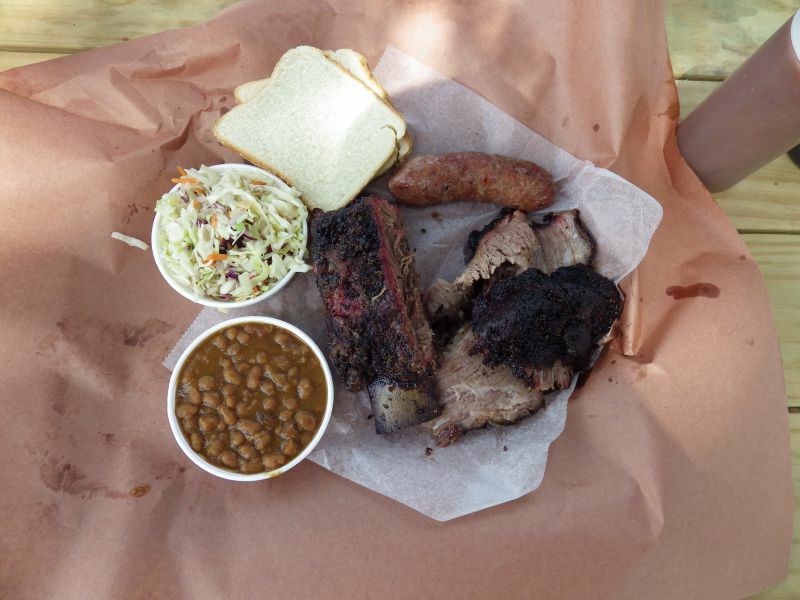 I placed our order which this day included a beef rib. 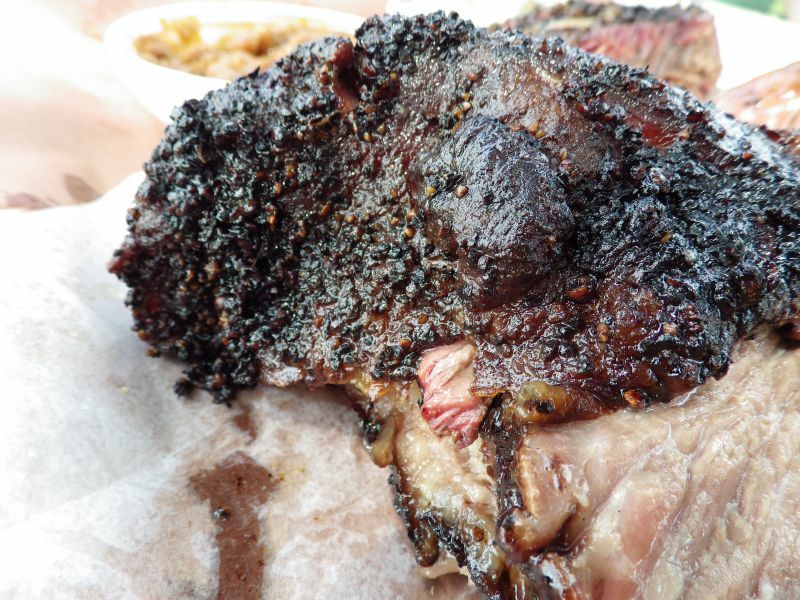 While giant beef ribs (beef short ribs) are not a staple at every place, they are slightly more common in central Texas and hill country joints. They are not common in the Houston area and I didn’t see beef short ribs on the menu at my other favorites like Gatlin’s, Corkscrew, Brooks’ Place, Virgie’s, or Fargo’s. I asked for a ½ pound of fatty brisket and I was rewarded with the Holy Grail for a true BBQ aficionado, the “burnt end”. Some folks may turn this down but contrary to the name it isn’t burnt. It is the “end” of the brisket which can be either end. It will contain a bit of fat, but when perfectly smoked it is a delicacy. The smoke that permeates the meat must pass through the bark so the smoky flavor fills the entirety of the bark and your piece of course is covered with the rub too. Killen’s uses a pepper heavy rub similar to the Mueller family style which is my favorite type of rub. It adds a texture to the outside of the bark like very course sandpaper. This burnt end was sliced just right with plenty of meat as well. I wanted to stop right where I was, hoist it high in the air, let everyone know I had it, and then bite down into it. But, I had to pay first. In addition to the beef I ordered a single link of sausage, baked beans, and coleslaw. We sat down and I stared at the burnt end. I picked it up and examined it. Then I closed my eyes and took a bite. Once again Killen’s brisket was a winner. The burnt end was astounding. The rest of the slices of brisket were still great but not as great as that burnt end. We felt the slices had slightly less flavor than our first visit and if I didn’t count the burnt end I would have given a slight edge in brisket category to the previous day’s trip to Corkscrew but the burnt end put it over the top. I also like the rub better at Killen’s. Ronnie and team know what they are doing and I can’t wait for the permanent building to open up. Next up was the beef rib. It was reminiscent of Louie and John Mueller’s places with their thick pepper rubs. I tugged at the meat and it resisted just slightly; this is a sign of perfectly smoked ribs. Daniel Vaughn, BBQ Editor at Texas Monthly and who owns the Full Custom BBQ Blog, is trying to right the world of rib reviewers. “Fall off the bone” is NOT a perfect rib. Just like brisket, one can overcook a rib and the meat will fall off the bone, but it usually will be dry or will have moisture added via external means, such as sauce. A perfectly done rib will just barely cling to the bone. A light tug will separate the meat and of course it should be moist without the need for sauce. This rib was smoked to perfection. I rate it above my most recent beef ribs at Opie’s, Blacks, and even my most recent one at John Mueller Meat Company. I slot it below Louie Mueller though but it wasn’t far off. I’ve said before that Killen’s can hold its own against the best in the world and I’ll say it again based on the beef rib. Next up was the sausage. Sigh. 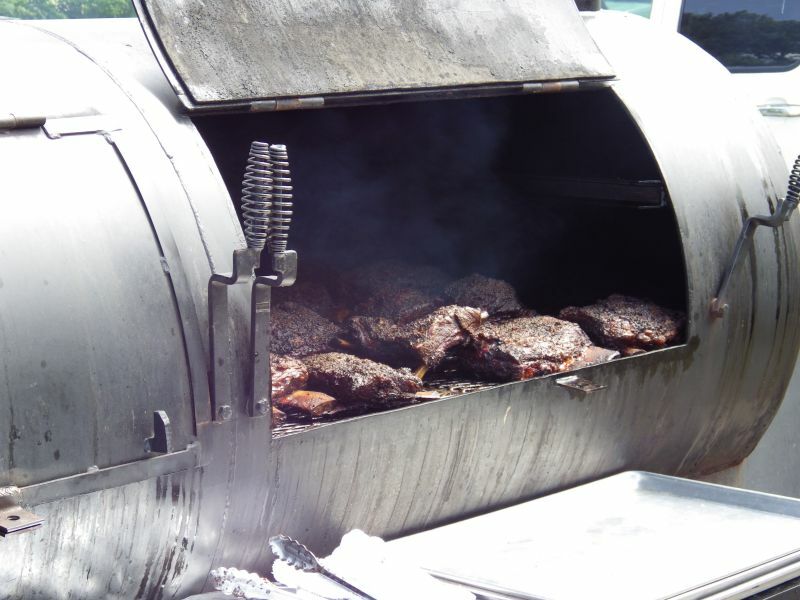 After the rib and brisket it was up against tough company and again it needed more time in the smoke. It wasn’t as undercooked as last time; it was much more done than my first visit, but I would have preferred for it to spend much more time in the smoker for my taste. The filling looks a little complex and it had moisture but it just didn’t pop my senses. The casing was soft and lacked snap but I would attribute it to not getting enough heat. It’s not enough to stop me from visiting here, but it is enough to knock the overall rating down a notch or two. The baked beans brought us back into the great territory. Leslye tasted a hint of mustard and brown sugar and mentioned it tasted like her mother’s beans. That is a high compliment and I’d recommend getting them as one of your choices. The coleslaw was very light on vinegar and had sunflower seeds tossed in the mix. I also thought maybe sunflower oil was in there as well. It was different than most but I’ll opt for the potato salad next time as my second side. I sampled all three sauces towards the end of my meal. All three have a unique flavor and the coffee sauce is interesting. If you are one to use sauce I would recommend trying them all, but take a taste of the meat without any sauce before you drown it. You may find that there is no need. Once again Killen’s knocked it out it out of the park. On the strength of the beef rib this time and with great brisket I still claim them as a top ten. They are weak in the sausage category based on my two visits and this knocks them down the overall rankings but this means I get to schedule another trip in the near future. We left nearly two hours after our arrival and headed of for two more scheduled stops before we would make it home. I’ve got to get out to Dallas and make another run to Austin very soon but I am already looking forward to my next visit to Killen’s.